Redshift COPY NOLOAD – Check data file validity without actually loading the data, facts and findings. As per above comments, if we need to check data file validity, NOLOAD option in COPY command offers faster performance. I have done some practical testing regarding this and in this post I am going to share my findings with you. Now let us see how NOLOAD is used along with copy command? Environment preparation to check the data file validity. 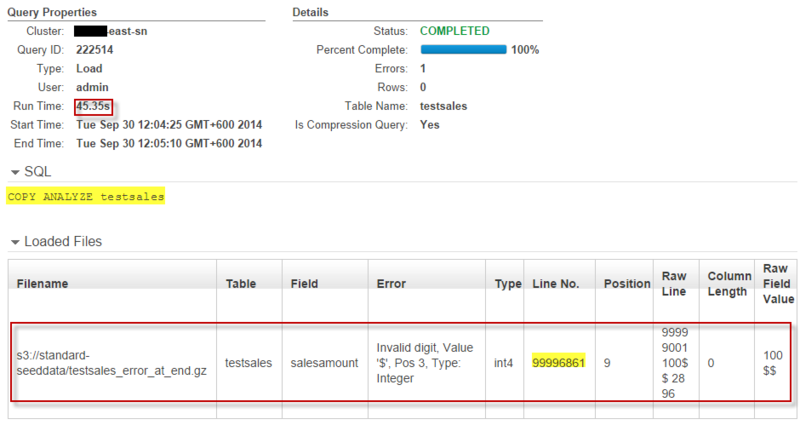 1 testsales_good.gz This file does not contain any error records. The file can be uploaded successfully using copy command. 2 testsales_error.gz This file contains some error records at middle of the file. COPY command generates error during data load. 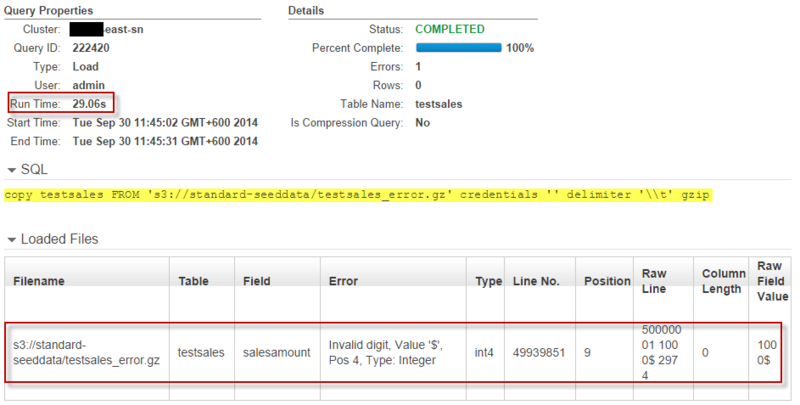 3 testsales_error_at_end.gz This file contains some error records at end of the file. COPY command generates error and fails to load this file. You can see, in the text file “salesamount” column contains dollar sign ($) end of the amount. As the column data type is Integer (not Currency), the table will generates error while inserting these values (1000$, 1500$). Uploaded the data file using COPY command to take the time with NOLOAD option. This command also successfully uploaded 100 million records into the target table. Figure 03: COPY Command using good data file with NOLOAD option. Tried to upload the error data file using COPY command without NOLOAD option. The COPY command generates error when attempted to load at line # 49939851 (error contains middle of the file) and rollback the data loading process. The following image shows that: Figure 04:Error data in middle – without NOLOAD. At this stage, COPY command execution is finished in different scenario to get an idea about the way to check the validity of the data file using NOLOAD option. In the above images, you might have been noticed the COPY “Run Time”. For example in Figure 06, you find “Run Time”= 58.84 seconds (58 seconds, 84 milliseconds). This “Run Time” is the COPY command. This is should not be considered as exact duration. I have stated in my earlier posts (Redshift COPY command- How to get actual data loading time) that when a COPY command is triggered, actual data loading process does not start immediately. Redshift performs some analysis on the target redshift table. In order to get the actual data loading duration we need to execute a SQL script. The SQL script is present in that post. I have executed that SQL statement using the “Query Id” that is generated after COPY command execution for each scenario. For example in “Figure 05” we got a Query Id=222494 when tried to upload the error (error records at end of the source file) data file using COPY command without NOLOAD option. After executing the SQL statement for all Query IDs of all scenario, I prepared the following summary of the duration matrix. Figure 07: Duration matrix of different COPY attempt. For Good file “COPY Command using NOLOAD” is slower than “COPY without NOLOAD” parameter. “COPY Command WITH NOLOAD”, total duration = 96 seconds so “COPY Command WITH NOLOAD” takes 96-69=33 seconds more. 2. For Good File, “COPY using NOLOAD” consumes more time for table analysis. When “NOLOAD” option is used system spends much time (48 seconds) for table analysis (For example: COPY ANALYZE testsales). It also takes similar time (48 seconds) to execute the actual COPY command. Using NOLOAD in COPY command does not insert any records to the target table. In both cases, COPY command using NOLOAD performs faster. I took 24 seconds when NOLOAD is used and it took 31 seconds when NOLOAD is not used for the data file that has error records at the middle of the file. Similarly, for the file that contains error records at the end, 45 seconds are required with NOLOAD and 60 seconds without using NOLOAD parameter in the COPY command. When source data file contains error records and NOLOAD option is used to check the validity of the data file, Redshift only executes “COPY ANALYZE” command. As a result only table analysis is performed, no actual COPY command is executed. 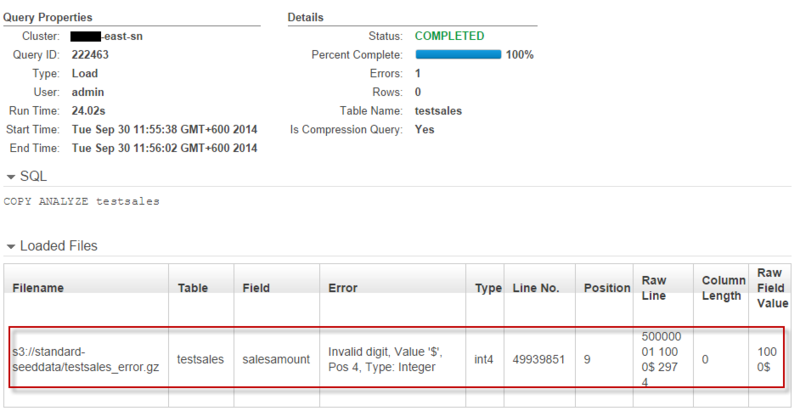 So “Actual Copy Command Duration” is showed “NULL” in the above duration matrix table. For data file that contains no error records, COPY command with NOLOAD option took more time than executing only COPY command without NOLOAD. For good data file, if NOLOAD option is used, both “COPY ANALYZE” and “COPY … FROM” command gets executed. Though “COPY … FROM” does not import any data but it consumes time. For data file that contains error records, “COPY command without NOLOAD” executes both “COPY ANALYZE” and “COPY … FROM” command. In that case “COPY ANALYZE” duration is low but “COPY … FROM” continues exaction until reach towards the error line. For error records containing file, “COPY command with NOLOAD” is faster. It only performs analysis on the target table by issuing “COPY ANALYZE” command. “COPY … FROM” command never gets executed. Performance measurement to check the validity of data file using “NOLOAD”, depends on where the error records exists in the data file. If error records exists beginning of the file, data file validity checking is finished earlier. In worst case scenario, if error records resides near end of the file, data file validity checking duration is much higher. Please be noted this test results, observations and findings related to “NOLOAD” option are very specific in a particular scenario. Test outcome may heavily vary for different data files, number of columns of the target table and data type of the table columns. So, if you want to check data file validity using “NOLOAD” option, please test it using your domain specific source data file in your own environment. 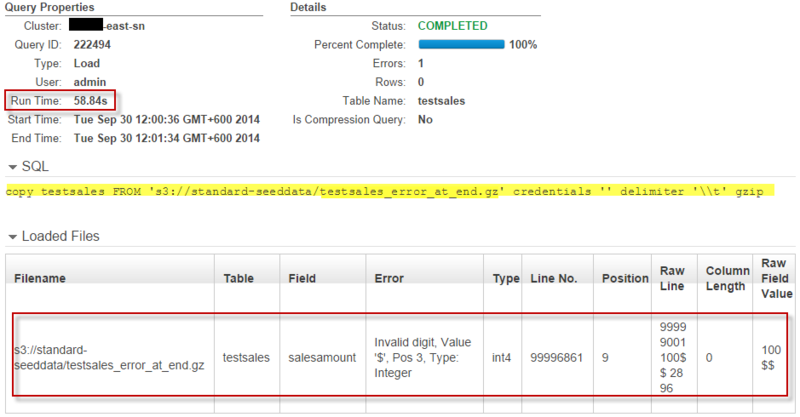 This entry was posted in Amazon Redshift, Redshift COPY Command and tagged NOLOAD, Redshift COPY by Khorshed. Bookmark the permalink. Khorshed has 12 years of cumulative professional experience in areas of database administration, development, Business Intelligent, system appreciation, requirement analysis and software development (using .net technologies). Achieved MCITP in SQL Server in both SQL Server development and administration. He has vast knowledge in SQL Server, SSIS, SSRS, SSAS. He is also proficient in Amazon cloud services like Redshift, Data Pipeline, SNS, DynamoDB, EMR and many more.